Here is another post by Medieval Codes researcher Hailey Mullock on decoration in a Lydgate manuscript. London, British Library MS Royal 18 D II, fol. 147v. Medieval manuscripts are often miscellanies of several works. 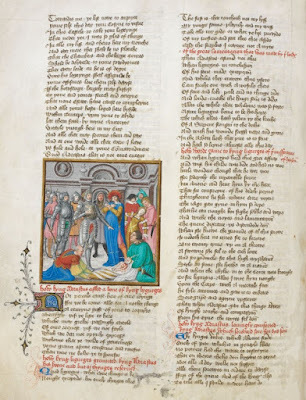 British Library MS Royal 18 D II contains several works along with John Lydgate’s Troy Book. Lydgate’s Siege of Thebes, also included in Royal 18 D II, is the complement to Troy Book. 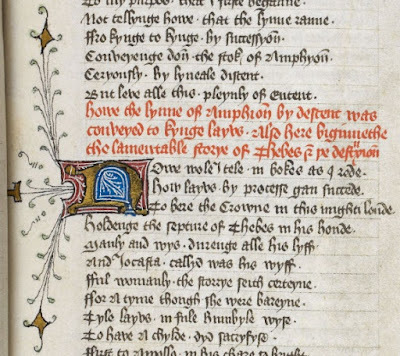 Siege of Thebes was written to be the last tale of Chaucer’s Canterbury Tales, with Lydgate himself inserted as a pilgrim on the Canterbury pilgrimage. Unlike Troy Book, Siege of Thebes was not written for a patron, but was still a very popular and widely circulated text. It was a continued presence in English Renaissance literature because of John Stow’s 1561 edition of The Workes of Geffrey Chaucer. 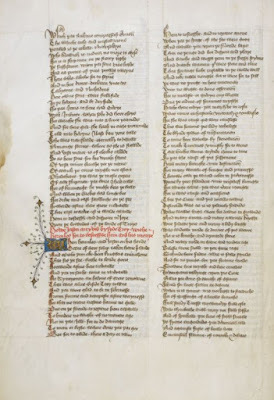 Stow included Lydgate’s poem among his ‘divers addicions’ to Chaucer. Lydgate’s work as the last tale of the Canterbury Tales balances out the Knight’s Tale by providing the story of the siege of Thebes, ending where the Knight’s Tale begins. The Siege of Thebes continues the decorative style of Troy Book. However, the illustrator, and possibly the scribe, are different than those of Troy Book. The additional illustrations in Books 3 and 4 of Troy Book, along with the decoration and illustrations of Siege of Thebes, are attributed to Gerard or Lucas Horenbout. The scribe(s) of the two texts are not identified, but the difference in decoration arrangement suggests that there are two different scribes. Although the style of decoration is similar and the elements of decoration are the same, the decorations of Siege of Thebes are not used in the same way as they are in Troy Book. The hierarchy of decoration in Siege of Thebes is not consistent with Troy Book’s hierarchy of decoration. One of the most notable differences between the two is the use of rubrication. In Troy Book, rubrication is used at the beginning of Books and as chapter titles. When used at the beginning of Books, rubricated text is followed by a large display initial, and as a chapter title it is followed by a medium display initial and in the later Books occasionally by a small initial. This usage is consistent throughout the text. In Siege of Thebes, rubrication occurs far more often. Rubrication is used similarly at the beginning of Books, but it is also used throughout followed by medium display initials, small display initials, and with no display initial. These more frequent, and somewhat random, rubrications do not function as chapter titles. Although the more frequent rubrication makes the hierarchy of decoration less organized and consistent, it does provide more regular summaries of the sections of the text, allowing the reader to move easily to find a specific section of the text. Medium and small display initials appear to sit in a similar position in the hierarchy of decoration in Siege of Thebes as they do in Troy Book; however, they are not used consistently, making it difficult to tell their exact position in the hierarchy. Medium display initials seem to be used for new chapters and small display initials used for a new speaker or point of view, as in Troy Book. Display initials, like rubrication, are used more often in Siege of Thebes than in Troy Book. Therefore, either the hierarchy of decoration is different although it looks similar, or the scribe has decided to create significantly more divisions in the text than there are in Troy Book, while attempting to maintain a similar hierarchy of decoration. Perhaps the scribe of Siege of Thebes increased the number of divisions in the text in order to provide the reader with regular places to stop and start reading the text, or to find a particular place in the text. However, the decoration of Siege of Thebes creates almost too many divisions in the text, rendering the divisions ineffective. The divisions are not as clear or consistent as they are in Troy Book. In Troy Book, using fewer decorative elements far more consistently, the scribe is able to draw the reader to the most important parts of the text and divides it in a way that is easy to navigate. 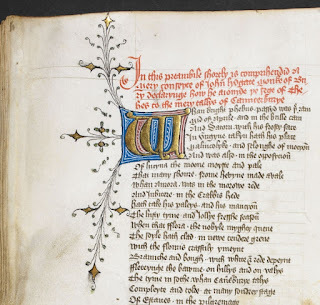 Is there a consistency in hierarchy of decorations between texts within a manuscript or would the medieval reader expect a change between texts? 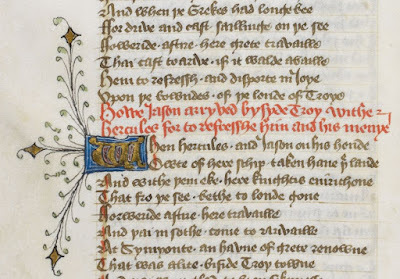 Were hierarchies of decorations easy for the medieval reader to recognize or would the one used in this manuscript for Siege of Thebes be more confusing than helpful to the reader? Information about Royal 18 D II can be found in the British Library's online catalogue entry.